When Historic New England’s Phillips House first opened as a museum in 1973, its founder, Betty Phillips (1906-1996), preserved the furnishings and knickknacks inside the house as a memorial to the Phillips family and to Salem’s Great Age of Sail. Betty’s husband, Stephen Phillips (1907-1971), had made multiple trips to the American Southwest during the late 1920s, 1930s, and 1940s. Some of the objects displayed in his childhood bedroom included a collection of black-on-black Pueblo pottery from New Mexico. In 1908 and 1909 archaeological digs in New Mexico uncovered several pieces of centuries-old black pottery. Edgar Lee Hewett, leader of the digs and author of the Antiquities Act of 1906, contacted San Ildefonso potter Maria Martinez (1887-1980) to see if she could recreate the decorative process. Maria mastered the technique and many San Ildefonso potters were invigorated by the new creative possibilities of the style. The revival of black pottery lasted through the 1920s and into the Great Depression. 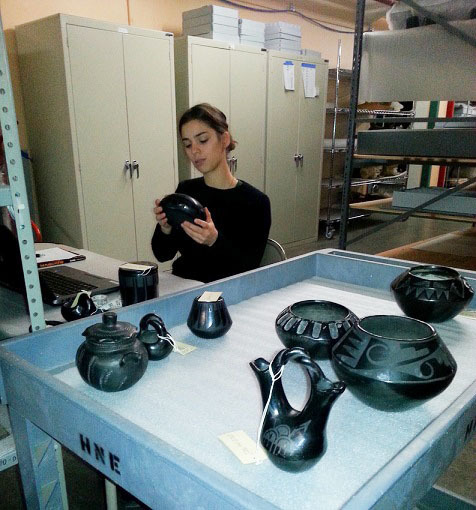 Take a look at Historic New England’s collection of black on black pottery which includes pieces signed by Maria Martinez, Rosalie Simbola Aguilar, and Tonita Martinez Roybal. To help preserve fascinating objects like these, please consider making a donation to the Collections and Conservation Fund. February 9, 2016: Updated to correct the name of the Antiquities Act of 1906.